Iceland is an island nation in the North Atlantic roughly 800 km (500 mi) northwest of Scotland. Settled by Norse explorers around 870, Iceland has had a legislature since 930, but for most of its history it was under the control of the kings of Denmark. In 1918, Iceland was granted full autonomy, and in 1944 it declared its independence. This age includes lighthouses of three of Iceland's eight regions: Vestfirðir (Northwest Fjords), Norðurland Vestra (the western north coast), and Norðurland Eystra (the eastern north coast). 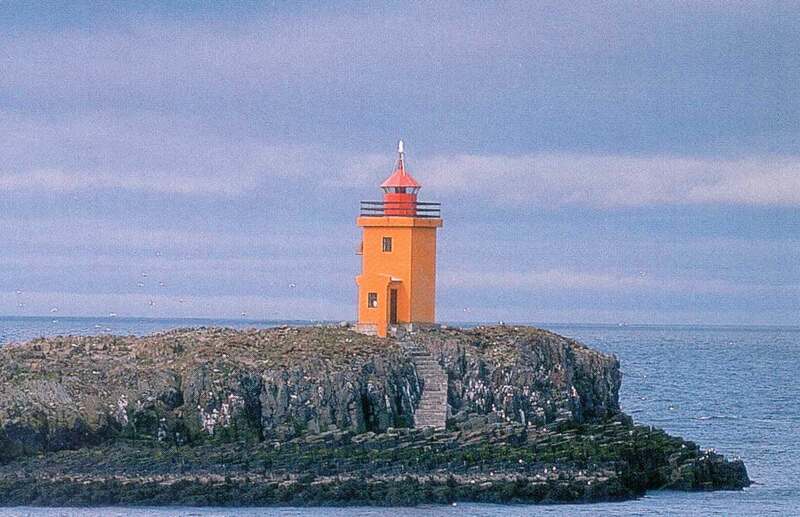 In Icelandic, the word for a lighthouse is viti (plural vitar); ey is an island, nes is a cape, and höfn is a harbor. The Icelandic alphabet includes the old Norse letters "eth" (Ð and ð) and "thorn" (Þ and þ), which are pronounced with the softer and harder forms of the th sound, respectively. 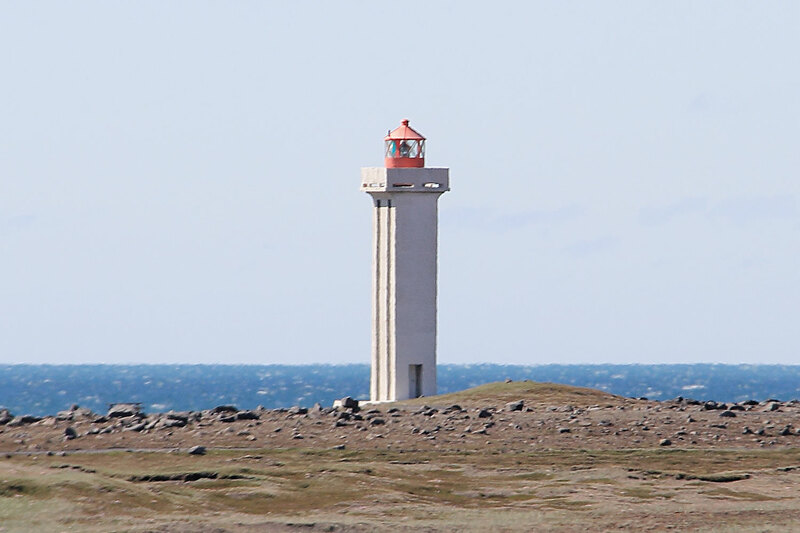 Lighthouses in Iceland are regulated by the Icelandic Transport Authority (Samgöngustofa, or ICETRA), which also maintains and operates the major coastal lights. Local port authorities operate harbor lights. ARLHS numbers are from the ARLHS World List of Lights. VIT numbers are from the Vitaskrá, the official Icelandic light list. Admiralty numbers are from volume L of the Admiralty List of Lights & Fog Signals. U.S. NGA List numbers are from Publication 115. 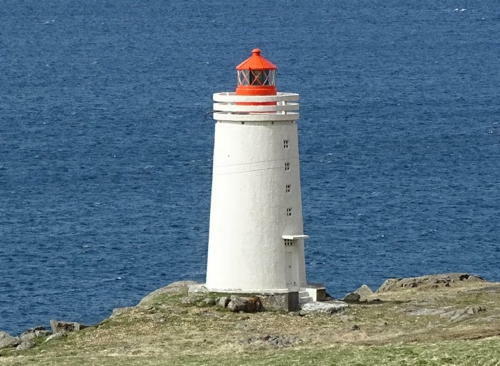 Posted by the Icelandic Maritime Museum (Sjóminjasafn Íslands), this site has small photos and historical notes for Iceland's lighthouses. Photos of 70 Icelandic lighthouses by Klaus Huelse. Photos by various photographers posted by Alexander Trabas. The photos for this area are by Ronald Wöhrn, Erich Hartmann, and Eckhard Meyer. Photos and accounts (in English). Flickr.com pool for photos of Icelandic lighthouses (well over 1000 photos). An attractive web site with several photo galleries; primarily in Icelandic. The official Icelandic light list can be downloaded in pdf format. Navigational chart information for Iceland. Note: Vestfirðir (Westfjords), in the northwestern corner of Iceland, is a fan-shaped peninsula cut by fjords into many fingers of land. The lighthouses of this dramatic but difficult terrain are poorly known. The permanent population of the region is only about 7300, with Ísafjörður being the largest town. 1926. Active; focal plane 15 m (49 ft); two flashes every 15 s, white, red or green depending on direction. 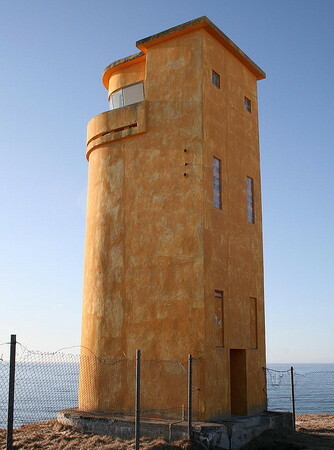 9 m (30 ft) square cylindrical concrete tower with lantern and gallery, painted yellow; lantern painted red. Tjerk Bartlema has a good photo, and Catriona Walker has a fine 2008 photo, and Bing has an indistinct satellite view. Flatey (Flat Island) is an inhabited island in the northern Breidafjörður about 18 km (11 mi) southeast of Brjánslaekur. 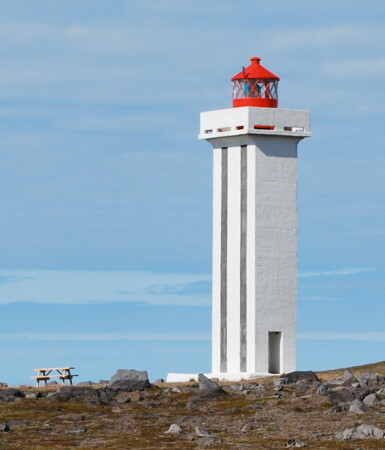 The lighthouse is located on Klofningur, a small island about 800 m (1/2 mi) off the entrance to Flatey's harbor. Note: there is another Flatey Light on the northeast coast of Iceland. Accessible only by boat; there are views from the ferry crossing the Breidafjörður from Stykkishölmur to Flatey and Brjánslaekur. Site status unknown. ARLHS ICE-063; VIT-83; Admiralty L4556; NGA 18496. 1954. 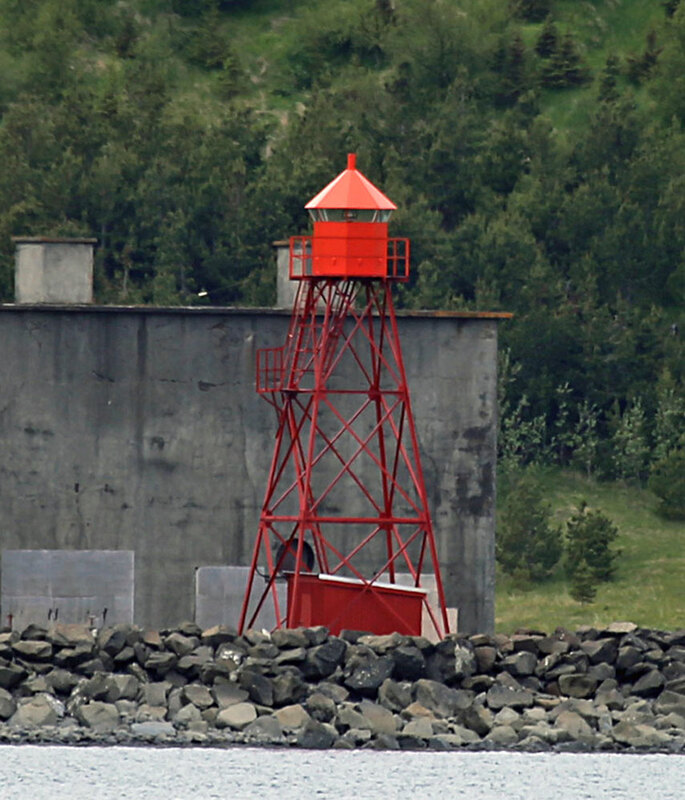 Active; focal plane 26 m (85 ft); white flash every 5 s. 5 m (17 ft) square cylindrical concrete tower with lantern, painted yellow according to NGA, but Sigrún Davíðsdóttir's 2011 photo shows that it is now painted white. Google has a distant satellite view. Located on a promontory on the south side of the Látrabjarg peninsula. Probably accessible only by boat. Site open, tower closed. ARLHS ICE-107; VIT-086; Admiralty L4558; NGA 18508. 1948 (station established 1913). Active; focal plane 60 m (197 ft); three white flashes every 15 s. 6 m (20 ft) square 2-story concrete building with a lantern on the seaward side of the second floor. The entire building is white. Ingunn Nielsen's photo is at right, the Maritime Museum has a page for the lighthouse, Wikimedia has photos, Jay Colingham has a 2016 street view, Frank Sæthre has a sunset street view, and Google has a satellite view. This lighthouse marks the westernmost point of Iceland, and thereby the westernmost point of Europe, at longitude 24°32'03" W. Located atop a vertical cliff called Látrabjarg. Accessible by road, but it's a long drive; 4WD strongly recommended. Site open, tower closed. ARLHS ICE-029; VIT-087; Admiralty L4560; NGA 18512. 1947. Active; focal plane 25 m (82 ft); one long (2 s) flash every 20 s, white, red or green depending on direction. 14 m (46 ft) round concrete tower with lantern and gallery. Tower painted white, lantern red. Atli Týr Ægisson has a 2008 photo, a view from the sea is available, and Google has a distant satellite view. 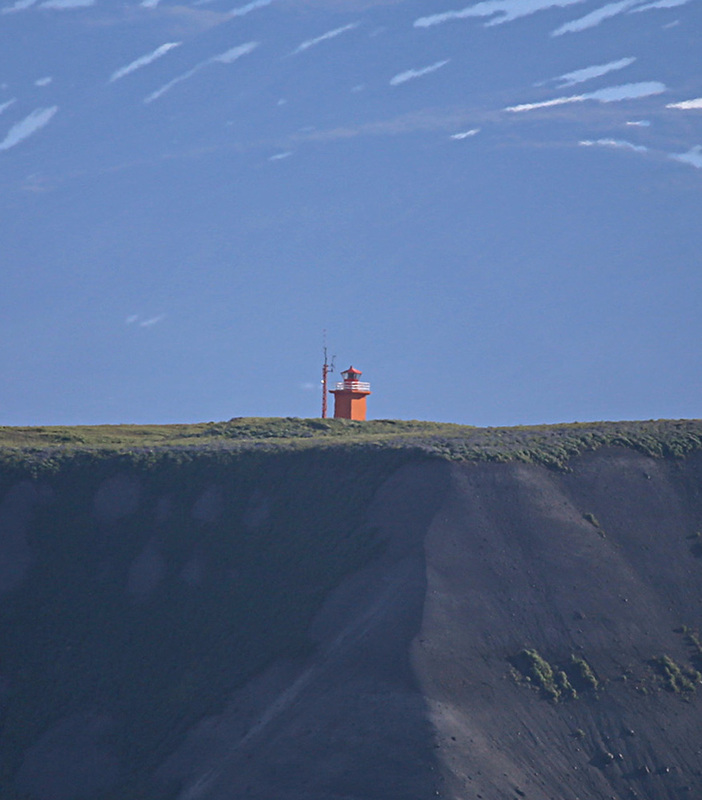 This lighthouse guides ships into the Patreksfjörður, the southernmost of a series of fjords cutting into the northwestern peninsula. 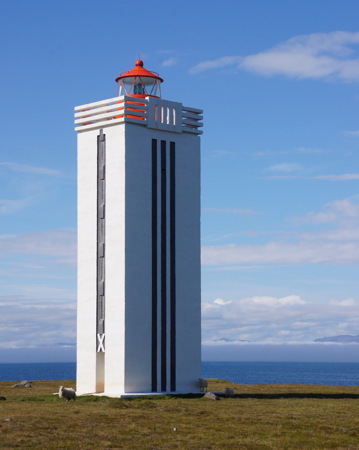 The lighthouse was built in 1943 with funds provided by Ólaf Jóhannesson, an area merchant, but due to the disruptions of World War II it was not activated until 1947. Located at Hænuvík on the south side of the Patreksfjörður; there is a road about 300 m (1000 ft) above the lighthouse. Site open, tower closed. ARLHS ICE-070; VIT-088; Admiralty L4562; NGA 18516. 1971. Active; focal plane 25 m (82 ft); two white flashes every 5 s. 6 m (20 ft) round lantern mounted at one end of a 1-story concrete fog signal or equipment building. Lantern painted white, building yellow. A small photo is available and Google has a distant satellite view. Located on a remote cape at the southern entrance to the Arnarfjörður. Accessible only by boat. Site open, tower closed. ARLHS ICE-121; VIT-095.5; Admiralty L4567; NGA 18520. 1950 (station established 1910). Active; focal plane 23 m (75 ft); flash every 15 s, white, red or green depending on direction. 5 m (17 ft) 2-story concrete building with a lantern and gallery on the seaward side of the second floor. 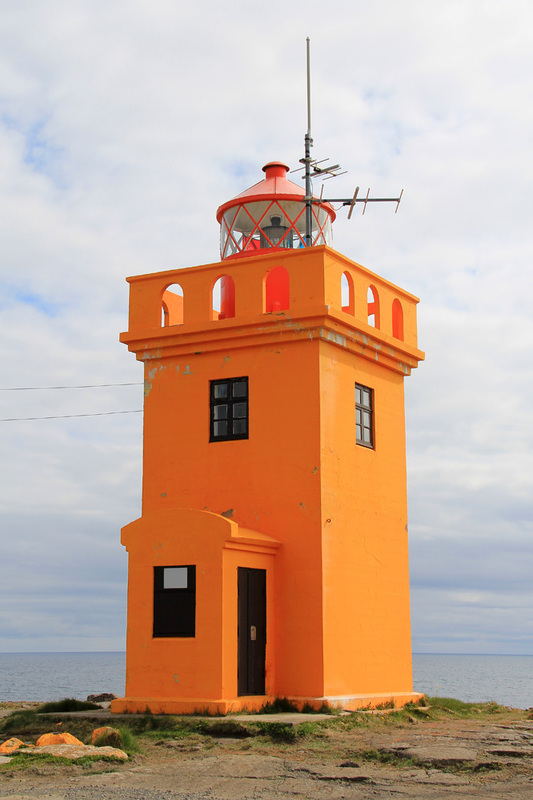 Lighthouse painted orange (formerly yellow). Arnbjörn Jóhannesson has a good photo and Google has a distant satellite view. Cliffs near this location are famous for birds. Note: this is one of two Langanes (Long Cape) lighthouses in northern Iceland; see near the bottom of this page for the other one. Located on the point of land at the fork of the Arnarfjörður into the branches known as the Suðurfirdir and the Borgarfjörður, about 2.5 km (1.5 mi) west of Laugaböl. Site status unknown. ARLHS ICE-122; VIT-096; Admiralty L4568; NGA 18524. 1920. Active; focal plane 52 m (171 ft); two long flashes every 20 s, white, red or green depending on direction. 6 m (20 ft) square concrete tower with lantern and gallery, painted orange; lantern painted red. Andrea Tonelli has a 2017 photo, Lucio Semboloni has a street view, and Bing has a satellite view. Svalvogar, the mountainous peninsula between the Arnarfjörður and the Drýafjörður, is famous in Icelandic folklore as the setting of the epic Gísla Saga. An unpaved road, popular with adventurous bicyclists, circles the peninsula and passes by the lighthouse. Located at the western tip of the peninsula. Site open, tower closed. ARLHS ICE-108; VIT-097; Admiralty L4570; NGA 18528. 1954. Active; focal plane 19 m (62 ft); white flash every 5 s. 12 m (39 ft) round concrete tower with lantern and gallery, painted yellow. A small photo is available, Bergthor Gunnlaugsson has a very distant photo of the cape in which the lighthouse is barely visible, and Google has a distant satellite view. Located on a cape (kagi) on the north side of the entrance to the Drýafjörður. Probably accessible only by boat. Site status unknown. ARLHS ICE-037; VIT-100; Admiralty L4574; NGA 18536. 1964. Active; focal plane 46 m (151 ft); white flash every 20 s. 3 m (10 ft) round lantern mounted on an octagonal concrete base. Lantern painted white. No photo available but Google has a satellite view. 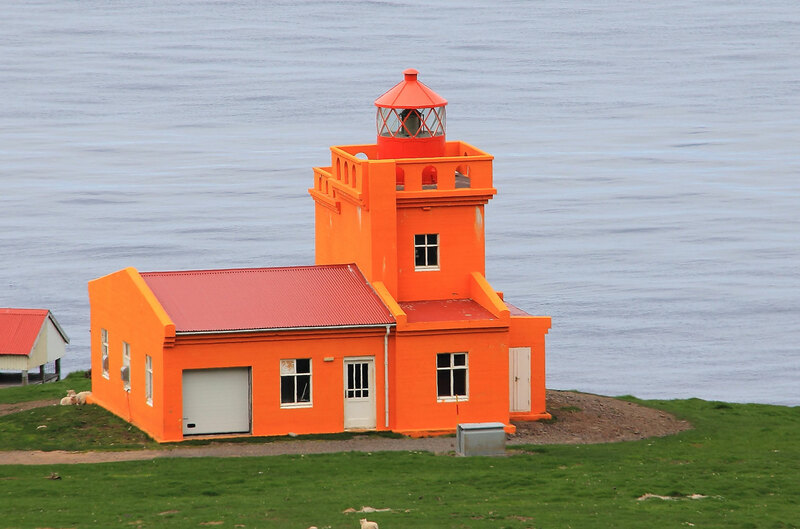 This is one of two Sauðanes lighthouses in northern Iceland; the other one is listed near the bottom of this page. Located at the tip of a peninsula about 5 km (3 mi) west of Suðereyi, marking the entrance to the Súgandafjörður. Probably accessible only by boat. Site status unknown. VIT-102; Admiralty L4575; NGA 18544. 1956 (station established 1920). Active; focal plane 32 m (105 ft); white flash every 5 s. 14 m (46 ft) square concrete tower with lantern and gallery, painted orange. Abandoned 1-1/2 story keeper's house. 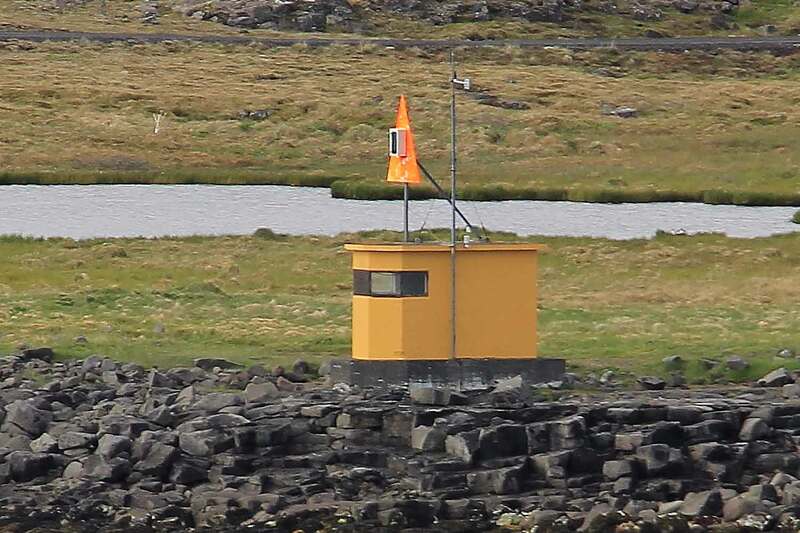 Ólafur Jonasson has a 2011 photo, Ingvar Hreinsson has a 2002 photo showing the lighthouse painted yellow, another photo is available, Trabas has Hartmann's distant view, and Google has a satellite view of the station. 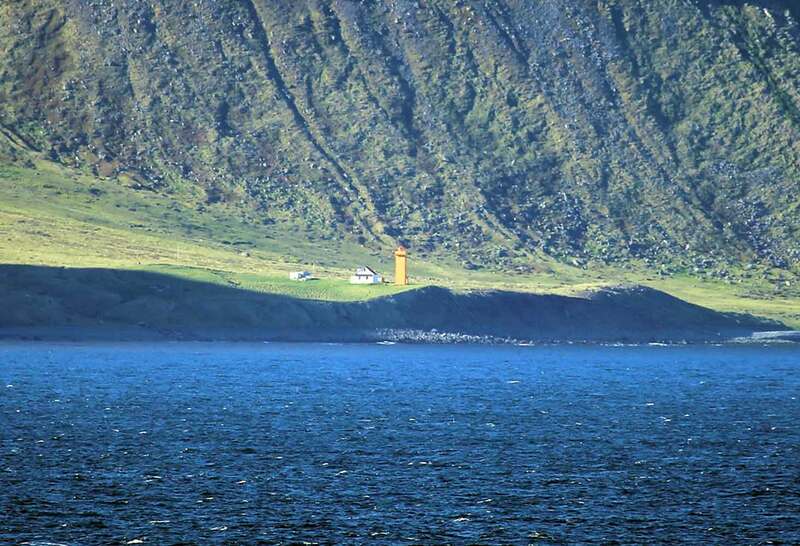 This lighthouse stands on a massive cliff, the Stigahlið, on the south side of the entrance to the wide bay of the Ísafjörður. Probably accessible only by boat. Site status unknown. ARLHS ICE-041; VIT-106; Admiralty L4578; NGA 18552. 1937. Active; focal plane 25 m (82 ft); three flashes every 20 s, white or red depending on direction. 6 m (20 ft) square stone tower with lantern and gallery. Lighthouse painted orange, lantern red. Christian Bickel's photo at right shows this daymark. 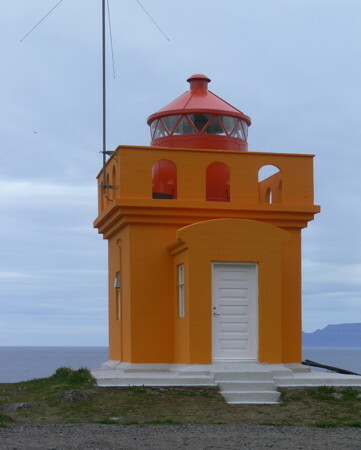 The lighthouse was formerly painted orange and the lantern yellow; in Huelse's photo the lighthouse color is red-orange. Trabas has Hartmann's distant view, Rognvaldur Olafsson has a 2016 street view, and Bing has a satellite view. Located on the south side of the Ísafjörður about 3 km (2 mi) east of Bolungarvík. Accessible by road. Site open, tower closed. ARLHS ICE-071; VIT-107; Admiralty L4580; NGA 18560. 1921 (station established 1902). Active; focal plane 60 m (197 ft); light 2 s on, 8 s off, white, red or green depending on direction. 6 m (20 ft) square corrugated iron tower with lantern and gallery. Tower painted yellow, lantern red. Huelse has a closeup photo, Trabas has Hartmann's distant view, and Bing has a satellite view. 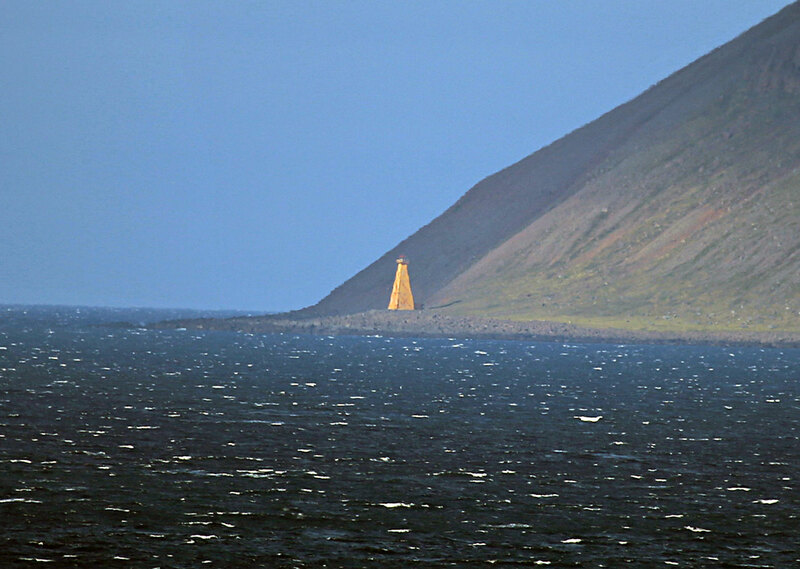 This lighthouse marks the entrance to the Skutulsfjörður from the Ísafjörður. 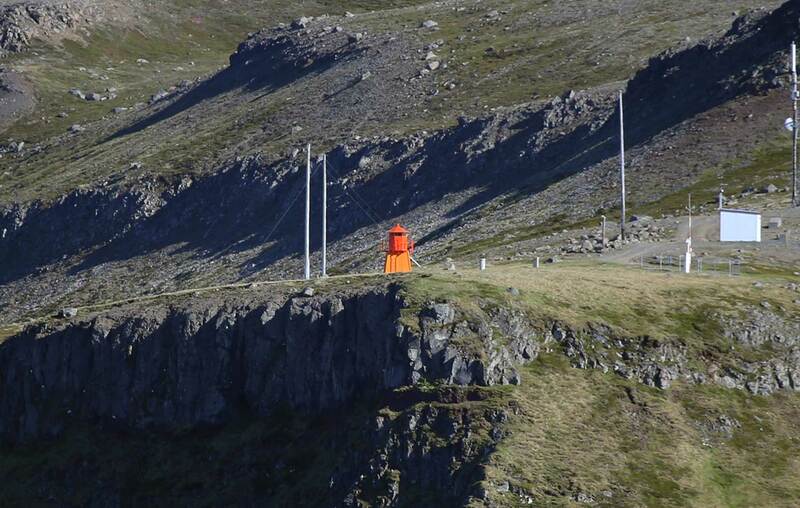 Located atop a steep promontory about 5 km (3 mi) north of Suðavík. Accessible by road: the lighthouse is on a bluff above highway 61. Site open, tower closed. ARLHS ICE-028; VIT-109; Admiralty L4584; NGA 18612. 1949. Active; focal plane 26 m (85 ft); two flashes every 22 s, white, red or green depending on direction. 13 m (43 ft) round stone tower with lantern and gallery. Lighthouse painted white, lantern red. Bing has a satellite view. Æðey is an island off the north shore of the Ísafjörður. This lighthouse was completed in 1944, but it could not be lit until 1949 because lighting equipment was not available during World War II. Located on the southern tip of the island. Site status unknown. ARLHS ICE-001; VIT-127; Admiralty L4582; NGA 18616. 1949. Active; focal plane 7 m (23 ft); two flashes every 10 s, white, red or green depending on direction. 6 m (20 ft) 2-story concrete building with a lantern and gallery on the seaward side of the second floor. Lighthouse painted yellow. No photo available but Bing has a satellite view. Located on a point of land on the north side of the Ísafjörður near the entrance, about 5 km (3 mi) west of Hesteyri. Accessible only by boat. Site status unknown. ARLHS ICE-126; VIT-128; Admiralty L4600; NGA 18628. 1919. Active; focal plane 30 m (98 ft); white flash every 4 s. 24 m (79 ft) square pyramidal concrete-covered tower with lantern and gallery. Lighthouse painted yellow, gallery red. The Siglingastofnun's photo is at right, Lightphotos.net has Bryan Richter's photo, Trabas has Hartmann's distant view from the sea, and Google has a fuzzy satellite view. The lighthouse was covered with concrete in 1930. 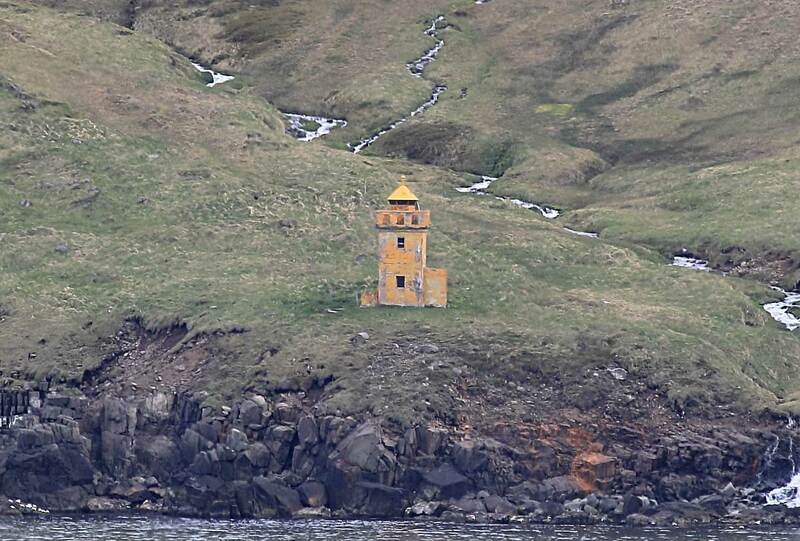 This unusual lighthouse stands at the tip of a peninsula marking the northwestern corner of Iceland. 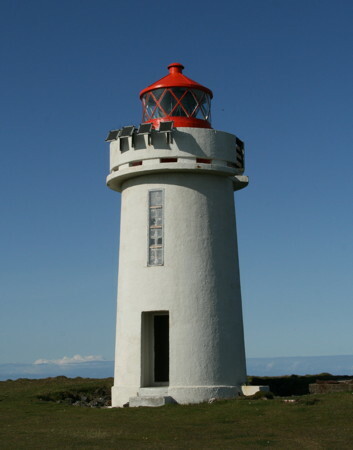 It is one of two Straumnes Lights in northern Iceland; the other one is listed near the bottom of this page. Accessible only by boat. Site open, tower closed. ARLHS ICE-088; VIT-129; Admiralty L4604; NGA 18632. 1930. 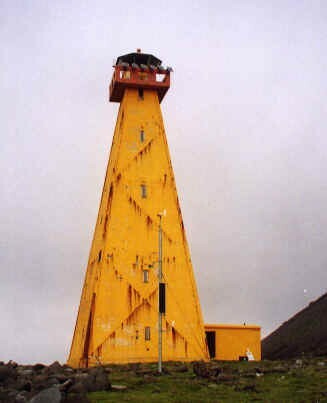 Active; focal plane 33 m (108 ft); two white flashes every 20 s. 10 m (33 ft) square cylindrical tower with lantern and gallery, attached to the seaward end of a 2-story Icelandic Coast Guard station. An excellent closeup photo is available, Gudmundur Ingimarsson has a nice view of the station, and Google has a distant satellite view. 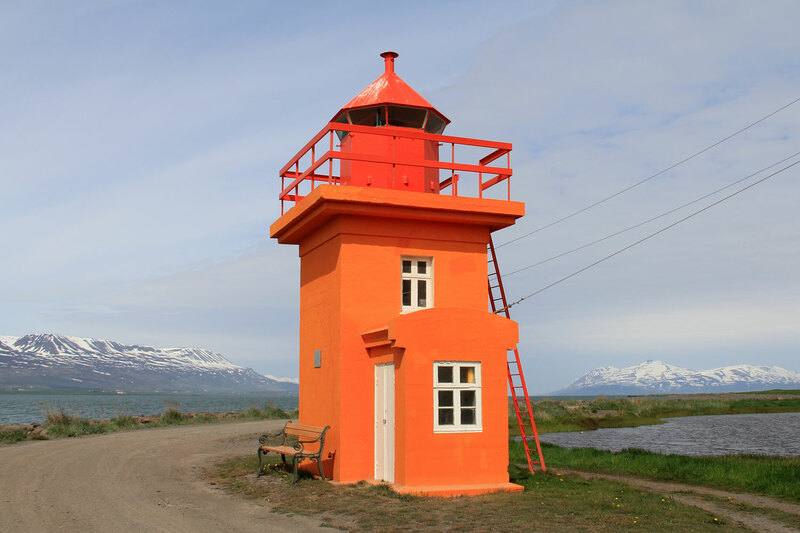 This lighthouse is located a few miles southeast of Horn, the northernmost cape of northwestern Iceland, and only about 17.5 km (11 mi) south of the Arctic Circle. Accessible only by boat. Site open, tower closed. ARLHS ICE-049; VIT-130; Admiralty L4606; NGA 18636. 1947. Active; focal plane 23 m (75 ft); one long (2.2 s) and one short flash every 30 s. 15 m (49 ft) round concrete tower with lantern and gallery, mounted on a round concrete base. Lighthouse painted white, lantern red. A Siglingastofnun photo is at right, Ingvar Hreinsson has a 2000 closeup and a view from the sea, there is a small 2005 photo, and Bing has a satellite view. 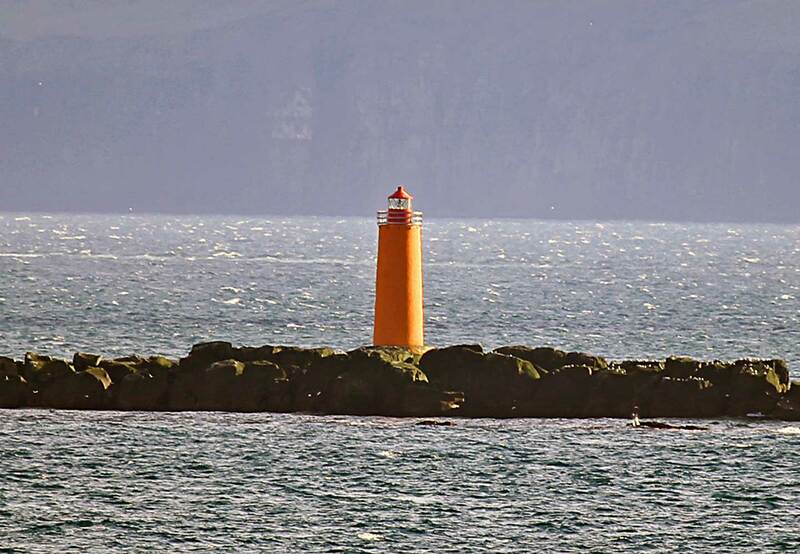 This lighthouse marks Munaðarnes, a prominent cape on the north coast at the western entrance to the Húnaflói, a broad bay that separates the northwestern fjord region from the rest of northern Iceland. Located on a rocky reef 5 km (3 mi) north northwest of the cape. Accessible only by boat. Site open, tower closed. ARLHS ICE-023; VIT-131; Admiralty L4608; NGA 18640. 1921. Active; focal plane 40 m (131 ft); four flashes every 30 s, white, red or green depending on direction. 24 m (79 ft) square pyramidal steel skeletal tower with lantern and gallery. Entire lighthouse painted red. Júlíus Ó Ásgeirsson has a photo and a distant view, and Bing has a satellite view. Located at the tip of an east-pointing peninsula about 5 km (3 mi) east of Gjögur. Accessible by 4WD. Site open, tower closed. ARLHS ICE-039; VIT-135; Admiralty L4616; NGA 18648. 1949. Active; focal plane 82 m (269 ft); flash every 10 s, white, red or green depending on direction. 10 m (33 ft) square cylindrical concrete tower with lantern. Lighthouse painted yellow, lantern red. Willis Chung has a view from the sea, Google has a street view from highway 645 on the mainland, and Bing has a satellite view. Not to be confused with the much better known island of Grímsey in Norðurland Eystra (see below). Grímsey is an island off the north side of the entrance to the Steingrimsfjörður near Drangnes. Located on the highest point of the island. Accessible only by boat. Site open, tower closed. ARLHS ICE-006; VIT-137; Admiralty L4620; NGA 18656. 1948 (station established 1914). Active; focal plane 27 m (89 ft); two flashes every 15 s, white, red or green depending on direction. 3 m (10 ft) 1-story concrete building; the light is displayed through windows in the front. Lighthouse painted yellow. A small photo is available, Google has a distant street view, and Bing has a satellite view. Located on a promontory on the east side of Drangnes. Accessible by road. Site open, tower closed. ARLHS ICE-123; VIT-138; Admiralty L4622; NGA 18660. Note: Norðurland Vestra has a population of about 7800; the largest town is Sauðárkrókur, at the head of the Skagafjörður. Note: The Húnaflói is the largest bay of Iceland's north coast, about 100 km (60 mi) long and 50 km (30 mi) wide. 1951. Active; focal plane 52 m (171 ft); three flashes every 30 s, white, red or green depending on direction. 14 m (46 ft) round stone tower with lantern and gallery. Lighthouse painted white, lantern red. Michel Vanesse's photo is at right, Alberto Godino has a lovely view of the lighthouse, the Maritime Museum has a page for the lighthouse, Sergei Zajarin has a 360° drone view, and Google has a satellite view. This lighthouse has the same design as the 1949 Ædey lighthouse (see above). Located on a bluff marking the east side of the entrance to the Miðfjörður, about 11 km (7 mi) north of Hvammstangi. Site open, tower closed. ARLHS ICE-083; VIT-140; Admiralty L4628; NGA 18672. Date unknown. Active; focal plane 19 m (52 ft); green light occulting once every 5 s. Light mounted on the center of a strikingly modern concrete church tower. Arnbjörn Jóhannesson has a photo, Google has a street view, and Bing has a satellite view. The front light is on a post. Located in the fishing town of Skagaströnd on the east side of the Húnaflói. Site open, tower closed. VIT-142.1; Admiralty L4632.1; NGA 18680. 1942 (station established 1913). Active; focal plane 23 m (75 ft); two long flashes every 20 s, white, red or green depending on direction. 16 m (52 ft) square cylindrical concrete tower with lantern and gallery. Lighthouse painted white, lantern red. A 2010 photo is at right, the Maritime Museum has a page for the lighthouse, Wendy Crockett has a 2008 photo, Vilhjálmur Ingi Vilhjálmsson has a photo, and Google has a distant satellite view. 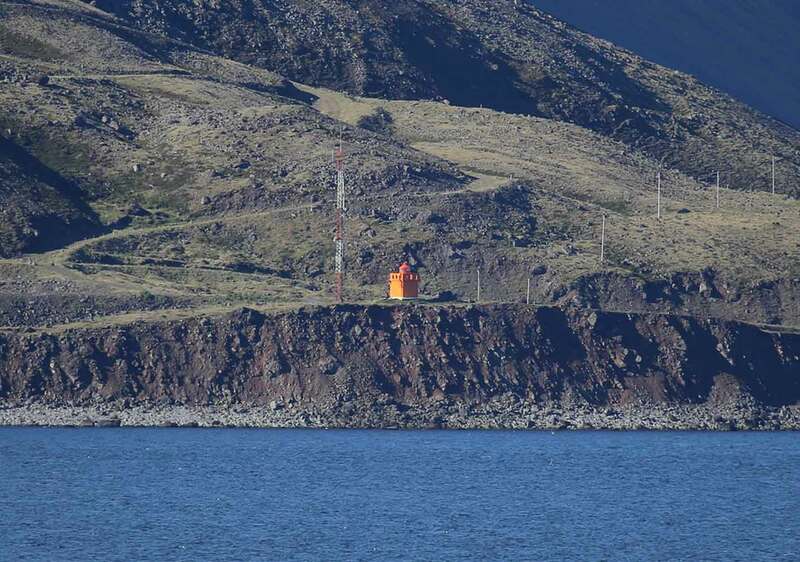 This lighthouse marks the eastern entrance to the broad bay of the Húnaflói. 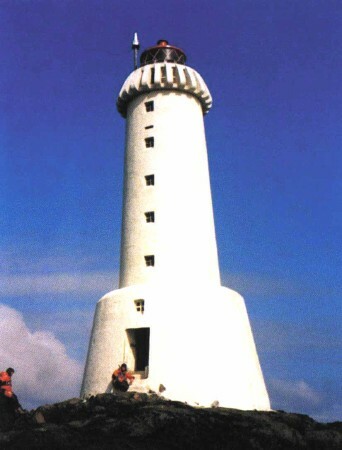 The original lighthouse was similar to the surviving Straumnes Northwest lighthouse (see above). The present lighthouse was completed in 1940, but World War II delayed its lighting equipment. Located about 25 km (15 mi) north of Skagaströnd. Accessible by road. Site open, tower closed. ARLHS ICE-058; VIT-147; Admiralty L4635; NGA 18684. 1935 (station established 1913). Active; focal plane 18 m (59 ft); white flash every 10 s. 9 m (30 ft) square cylindrical concrete tower with lantern and gallery. Lighthouse painted yellow, lantern red. Huelse has a distant photo, and Bing has a satellite view. Skagatá is one of several very prominent capes on the north coast of Iceland. Located on the cape, about 80 km (50 mi) northwest of Sauðárkrókur. May be accessible only by boat. Site open, tower closed. ARLHS ICE-082; VIT-148; Admiralty L4636; NGA 18688. Date unknown. Inactive. Light formerly mounted on the roof of a church (not on the steeple). Google has a street view and Bing has a satellite view. The light was moved to a skeletal tower nearby (next entry). Sauðárkrókur, at the southwestern end of the Skagafjörður, is one of the largest towns of Iceland's north coast, with a population of about 2700. Located near the center of town. Site open, tower closed. Date unknown. Active; focal plane 18 m (59 ft); continuous red light shown only when vessels are expected. Approx. 16 m (52 ft) triangular skeletal tower carrying a red triangular daymark, point up. Google has a street view and Bing has an indistinct satellite view. The rear light is on a post on a hill behind the town. Located off the Freyjugata about 100 m (110 yd) east of the church. Site open, tower closed. VIT-150; Admiralty L4640; NGA 18692. 1937. Active; focal plane 24 m (79 ft); one long (2 s) flash every 13 s, white, red or green depending on direction. 10 m (33 ft) square cylindrical concrete tower with lantern and gallery. Lighthouse painted yellow, lantern red. The Maritime Museum has a page for the lighthouse, Oli Arnar Brynjarsson has a very distant view from the sea, and Bing has a satellite view. 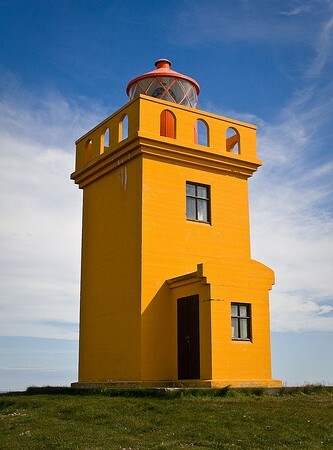 The lighthouse was originally painted white with a red horizontal band; it was repainted in yellow in 1966. Located on a promontory at the southern end of the Skagafjörður, about 5 km (3 mi) east of Sauðárkrókur. Accessible by a walk of about 2 km (1.2 mi); Anke and Jens comment on the spectacular scenery. However, Radek Litersky found the area to be closed as a bird sanctuary in 2017. Site status uncertain. ARLHS ICE-046; VIT-154; Admiralty L4644; NGA 18700. 1938. Active; focal plane 66 m (217 ft); two long (1.5 s) flashes every 15 s, white, red or green depending on direction. 9 m (30 ft) square cylindrical concrete tower with lantern and gallery. Lighthouse painted yellow, lantern red. Google has a satellite view. Málmey is a high island in the eastern entrance to the Skagafjörður; sheer cliffs surround it on all sides. Located on the southeast side of the island. Accessible only by boat. Site status unknown. ARLHS ICE-013; VIT-155; Admiralty L4648; NGA 18712. 1942. Active; focal plane 19 m (62 ft); flash every 6 s, white, red or green depending on direction. 9 m (30 ft) octagonal concrete tower with lantern and gallery. Lighthouse colored with gray and white vertical stripes; lantern painted red. Huelse's closeup photo is at right, Trabas has Wöhrn's distant view, and Bing has a satellite view. This is one of two Straumnes lighthouses in northern Iceland; the other one is listed above. Both lighthouses have unusual and striking designs. Located on a promontory facing the Arctic, about 15 km (9 mi) northeast of Hofsós. Site open, tower closed. ARLHS ICE-087; VIT-156; Admiralty L4650; NGA 18716. 1934. Active; focal plane 37 m (121 ft); three flashes every 20 s, white or red depending on direction. 10.5 m (35 ft) square cylindrical concrete tower with lantern and gallery, rising from one end of a 1-story concrete keeper's house. Lighthouse painted yellow, lantern red. The Maritime Museum has a page for the lighthouse, Lightphotos.net has a photo by Roy Wraanes, Trabas has Wöhrn's closeup photo, M.C. McCarron has a distant photo, and Google has a distant satellite view of the station. 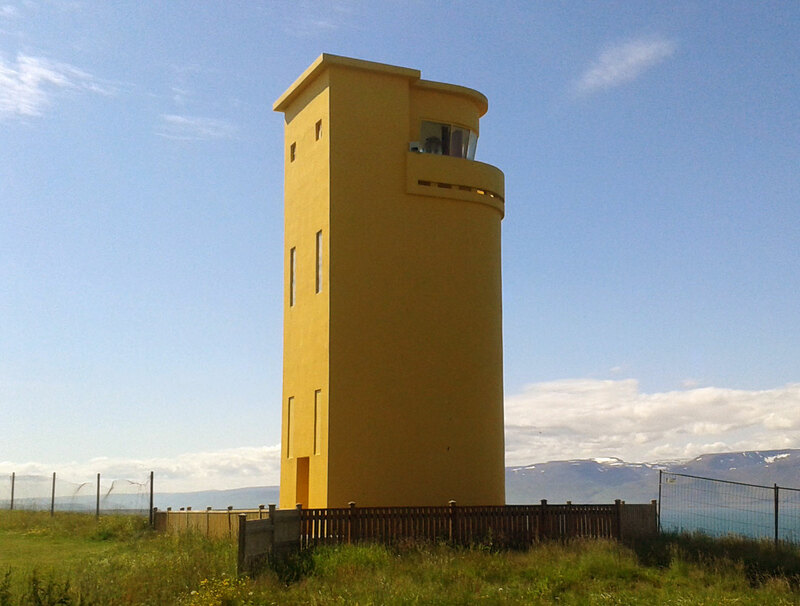 This is one of two Sauðanes lighthouses in northern Iceland; the other one is listed above. Located on a cape about 5 km (3 mi) northwest of Siglufjörður. Site open, tower closed. ARLHS ICE-125; VIT-158; Admiralty L4652; NGA 18720. 1930. Active; focal plane 20 m (66 ft); flash every 5 s, white, red or green depending on direction. 8 m (26 ft) stone tower, painted yellow. The lighthouse needs paint in a 2007 closeup photo, a second photo is available, Trabas has Wöhrn's photo, and Google has a satellite view. Located on the east side of the Siglufjörður opposite the fishing village of the same name. Site status unknown. ARLHS ICE-077; VIT-159; Admiralty L4654; NGA 18728. 1908. Active; focal plane 46 m (151 ft); white flash every 7.5 s. 12 m (39 ft) square cylindrical concrete tower with lantern and gallery, attached to a 1-story concrete keeper's house. Lighthouse painted yellow, lantern red. The Maritime Museum has a page with a closeup photo, Ingvar Hreinsson has a photo, and Google has a distant satellite view. A history of the station includes a 1912 photo showing the wood keeper's cottage formerly attached to the tower; it also shows the original daymark, white with a red horizontal band. 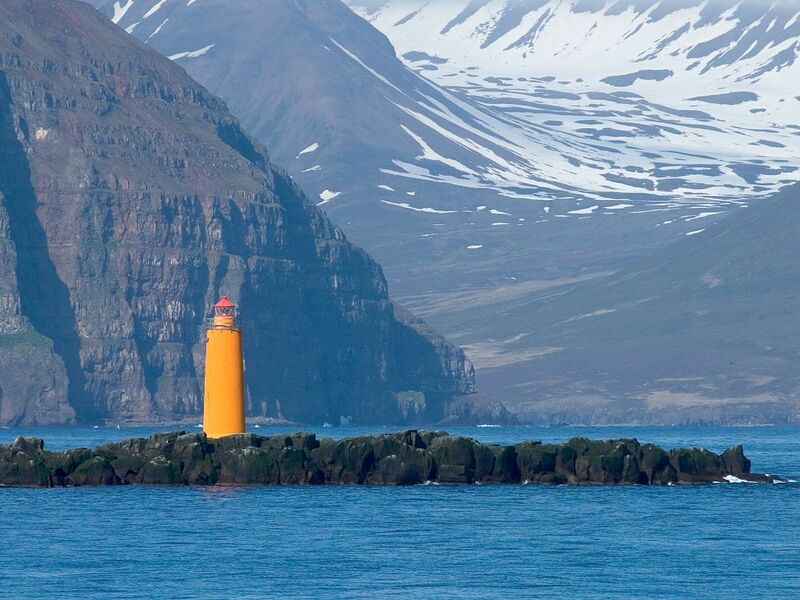 This is the oldest lighthouse on Iceland's north coast, marking one of several very prominent capes on the coast. The lighthouse was originally equipped with a Fresnel lens that had served in the Reykjanes lighthouse (see the Western Iceland page) since 1897. Removed in 1992, the historic lens is now on display at the Herring Era Museum (Síldarminjasafn Íslands) in Siglufjörður. The Maritime Museum also has a page describing the 100th anniversary of the lighthouse, celebrated in 2008. Located on heights above the cape, about 6 km (3.5 mi) northeast of Siglufjörður. Accessible only by boat. Site status unknown. ARLHS ICE-080; VIT-162; Admiralty L4656; NGA 18732. Note: Norðurland Eystra has a population of about 23,000. More than three quarters of the population lives in Akureyri, at the head of the Eyjafjorður. 1966. Active; focal plane 50 m (164 ft); three white flashes every 10 s. 4 m (13 ft) round lantern mounted on a concrete base. Lantern painted white. No photo available but Bing has a distant satellite view. The lantern was prefabricated in Norway, where many similar lights are in use. Located on the west side of the entrance to the Olafsfjorður and Eyjafjorður about 3 km (2 mi) northeast of the fishing village of Olafsfjorður. Accessible by a path from the village. Site open, tower closed. VIT-163; Admiralty L4660.6; NGA 18736. 1951. Active; focal plane 20 m (66 ft); white flash every 3 s. 16 m (52 ft) round concrete tower with lantern and gallery. The lighthouse is described as gray by NGA but Thomas O'Neil's excellent photo shows it to be painted yellow with a red lantern. Trabas has Hartmann's photo. Located on a small island ("Rolf's Skerry") in the center of the entrance to the Eyjafjorður (the island does not appear in Google's satellite view of the fjord). Accessible only by boat; there are distant views from the mainland. Site open, tower closed. ARLHS ICE-052; VIT-165; Admiralty L4658; NGA 18740. 1920. Active; focal plane 114 m (374 ft); flash every 8 s, white, red or green depending on direction. 9 m (30 ft) square cylindrical stone tower with lantern and gallery. Lighthouse painted yellow, lantern red. The Maritime Museum has a page with a photo, a 2008 photo is available, Andri Vidisson has a closeup, Trabas has Hartmann's distant view, and Bing has a fuzzy satellite view. Hrísey is an inhabited island in the Eyjafjorður; 7.5 km (4.7 mi) long, it is the second largest island of Iceland. The population is about 175. Located on a bluff on the northwestern side of the island. Anke and Jens found the area to be closed (private property). ARLHS ICE-051; VIT-166; Admiralty L4660; NGA 18752. 1920. Active; focal plane 14 m (46 ft); two flashes every 20 s, white, red or green depending on direction. 14 m (46 ft) square pyramidal skeletal tower with lantern and gallery, painted red. Huelse has a closeup, Daníel Starrason has another good photo, Trabas has Hartmann's photo, Google has a distant street view, and Bing has a distant satellite view. Hjalteyri is a small village (population about 40) on the west side of the Eyjafjorður, about 20 km (13 mi) north of Akureyri. Located on the point of a spit that protects the village harbor. Site open; Anke and Jens visited in June 2008 and report that the tower can be climbed, but the gallery seemed unsafe. ARLHS ICE-026; VIT-169; Admiralty L4666; NGA 18780. 1920. Active; focal plane 9 m (30 ft); one long flash every 6 s, white, red or green depending on direction. 8 m (26 ft) square cylindrical stone tower with lantern and gallery. Lighthouse painted yellow, lantern red. Huelse's photo is at right, Julien Didierjean has another good photo, Helga Kvam has a fine winter photo, Trabas has Wöhrn's photo, Raoul Brosch has a panoramic view, and Google has a street view and a satellite view. Svalbarðseyri is a small village on the east side of the Eyjafjorður, about 6 km (4 mi) north of Akureyri. Located on the shore on a promontory just north of the village. Accessible by road. Site open, and visitors can climb an external ladder to the gallery. ARLHS ICE-096; VIT-174; Admiralty L4668; NGA 18788. 1970. Active; focal plane 30 m (98 ft); two white flashes every 10 s. 4 m (13 ft) round lantern mounted on a concrete base. Lantern painted white. Trabas has Hartmann's view from the sea, and Bing has a fuzzy satellite view. Located on the east side of the entrance to the Eyjafjorður. Accessible only by boat. Site open, tower closed. ARLHS ICE-110; VIT-174.5; Admiralty L4657; NGA 18792. 1937. Active; focal plane 27 m (89 ft); white light, 4 s on, 16 s off. 9 m (30 ft) square cylindrical concrete tower with lantern and gallery. Lighthouse painted yellow, lantern red. Hilmar Thor Johannsson's 2008 closeup is at the top of this page, Jón Ingi Cæsarsson also has a closeup photo, David Minkin has a good photo, Shelley McIntyre has a 2008 photo, and Google has a satellite view. Grímsey is an island precisely on the Arctic Circle, 41 km (25.5 mi) north of the mainland. The island has a permanent population of about 150 and is famous for its huge bird colonies. Grímsey is accessible by air or by ferry from Dalvik. Located on the southeastern tip of the island. Site open, tower closed. ARLHS ICE-007; VIT-175; Admiralty L4674; NGA 18796. 1963 (station established 1913). Active; focal plane 27 m (89 ft); three white flashes every 15 s. 9.5 m (31 ft) square cylindrical concrete tower with lantern and gallery. Lighthouse painted yellow, lantern red. Trabas has a commercial calendar photo, and Bing has a satellite view. 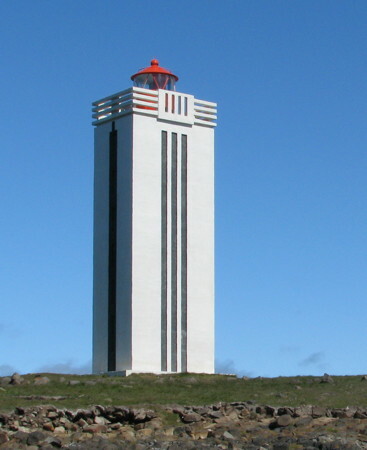 Although it was built 26 years later, this lighthouse appears identical in design to the Grímsey lighthouse (previous entry). Flatey ("Flat Island") is an island in Skjálfandi Bay. There was formerly a settlement on the island, but the last inhabitants departed in 1967. Ecotours visit the island today. Located on the east side of the island, north of the former settlement. Site open, tower closed. ARLHS ICE-005; VIT-176; Admiralty L4678; NGA 18800. 1956. Active; focal plane 50 m (164 ft); flash every 2.5 s, white, red or green depending on direction. 12 m (39 ft) semicircular cylindrical concrete tower with lantern and gallery inset in the top. Lighthouse originally painted yellow, but it has weathered to brown in the most of the available photos. A photo is at right, Trabas has Meyer's closeup photo, Huelse has a photo, Kjarten Palsson has another photo, Agnes Heiða Skúladóttir has a 2009 photo, and Google has a satellite view. Húsavík is a fishing port on the east side of Skjálfandi Bay. With a population of about 2400, it is one of the largest and most accessible locations in northeastern Iceland. Located on a promontory on the north side of the entrance to Húsavík harbor, about 2 km (1.2 mi) west of town. Site open, tower closed. ARLHS ICE-054; VIT-177; Admiralty L4680; NGA 18804. 1977. Active; focal plane 46 m (151 ft); white flash every 5 s. 4 m (13 ft) round lantern mounted on a concrete pad. Lantern painted white. Lundey (one of several Icelandic islands of that name) is a flat-topped island about 5 km (3 mi) north of Húsavík. A small photo is available and Google has a satellite view. Accessible only by boat. Site and tower closed. ARLHS ICE-095; VIT-182; Admiralty L4686; NGA 18824. 1929. Active; focal plane 35 m (115 ft); two white flashes every 15 s. 12 m (39 ft) square cylindrical concrete tower with lantern and gallery. Lighthouse painted yellow, lantern red. A very tall communications tower looms over the lighthouse, as seen in Huelse's photo. Google has a very distant street view and Bing has a satellite view. 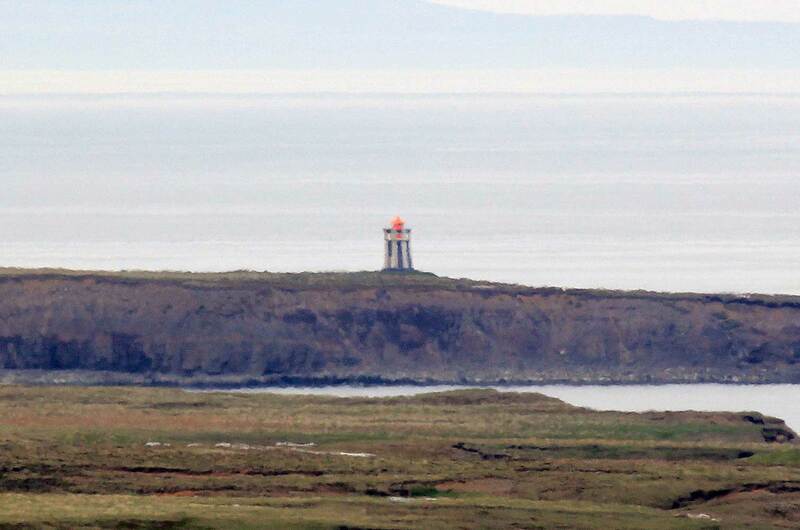 This lighthouse marks a prominent cape on the north coast, about 1 km (0.6 mi) northwest of Máná. Accessible by road. Site open, tower closed. ARLHS ICE-092; VIT-183; Admiralty L4688; NGA 18828. 1982. Active; focal plane 43 m (41 ft); white flash every 10 s. 4 m (13 ft) round lantern mounted on a concrete pad. Lantern painted white with a red roof. The lantern is just visible in Eirik Einarsson's distant view and Bing has a satellite view. Mánáreyjar is a rocky island about 5 km (3 mi) northeast of Tjörnes. Located on the highest point of the island. Accessible only by boat. Site and tower closed. ARLHS ICE-014; VIT-183.2; Admiralty L4689; NGA 18832. 1951. Active; focal plane 21 m (69 ft); one long (1.5 s) flash every 20 s, white, red or green depending on direction. 14 m (46 ft) square cylindrical concrete tower with lantern and gallery. Lighthouse painted white with narrow black vertical stripes, lantern red. A photo by Petr Brož is at right, Trabas has Wöhrn's photo, Lydur Gudmundsson has a photo, Huelse also has a photo, and Google has a very distant street view and a distant satellite view. Kópasker is a small fishing port on the east side of the Öxarfjörður and the west side of the Melrakkaslétta, Iceland's northeastern peninsula. Located on a promontory on the north side of the entrance to the harbor of Kópasker. Site open, tower closed. ARLHS ICE-043; VIT-184; Admiralty L4690; NGA 18836. 1958 (station established 1929). Active; focal plane 63 m (207 ft); three white flashes, short-long-short (Morse code "R"), every 20 s. 8 m (26 ft) square cylindrical concrete tower with lantern and gallery. Lighthouse painted yellow, lantern red. Haraldur Levi Jonsson has a 2016 photo, Hilma Steinarsdóttir has a distant view, and Google has a distant satellite view. Located on a promontory at the northwestern corner of the Melrakkaslétta, Iceland's northeastern peninsula, marking the entrance to the Öxarfjörður. Accessible by road about 15 km (9 mi) north northwest of Kópasker. Site open, tower closed. ARLHS ICE-072; VIT-191; Admiralty L4696; NGA 18840. 1951. Active; focal plane 21 m (69 ft); one long and one short flash every 30 s, white or red depending on direction. 19 m (62 ft) square cylindrical concrete tower with lantern and gallery. Lighthouse painted white, lantern red. The design of the building makes it appear at a distance to have one or more black vertical stripes on each face. Huelse has a good photo, Marcel Clarijs also has a good photo, Trabas has Wöhrn's photo, and Bing has a satellite view. This is Iceland's northernmost lighthouse, standing about 800 m (1/2 mi) south of the Arctic Circle at the northeastern tip of the island. Accessible by road about 10 km (6 mi) northwest of Raufarhöfn. Site open, tower closed. ARLHS ICE-050; VIT-192; Admiralty L4699; NGA 18844. 1931. Active; focal plane 33 m (108 ft); three flashes every 20 s, white, red or green depending on direction. 10 m (33 ft) square cylindrical concrete tower with lantern and gallery. Lighthouse painted yellow, lantern red. Huelse has a good photo, Stefan M. Seydel has an excellent closeup, Trabas has Wöhrn's photo, Elva Bra has a fine closeup, and Bing has a satellite view. Raufarhöfn is a fishing town near the northeastern corner of Iceland. Located on the east side of the entrance to Raufarhöfn harbor. Accessible by road. Site open, tower closed. ARLHS ICE-073; VIT-193; Admiralty L4700; NGA 18848. Date unknown. Active; focal plane 9 m (30 ft); green light occulting once every 5 s. 3.5 m (12 ft) 1-story equipment shelter. The light was formerly displayed through a window, but it has now been centered on a red triangular daymark on a pole mounted on the roof. The rear light is on a short skeletal tower. Trabas has Wöhrn's photo, Huelse has a photo, and Bing has an indistinct satellite view. Located on the south side of the harbor at Raufarhöfn. Site open, tower closed. VIT-194; Admiralty L4702; NGA 18856. 1956. Active; focal plane 23 m (75 ft); flash every 12 s, white or red depending on direction. 12 m (39 ft) semicircular cylindrical concrete tower with lantern and gallery. Lighthouse painted yellow. No photo available but Bing has a satellite view. Located on a cape about 15 km (9 mi) southeast of Raufarhöfn, marking the northern entrance to the bay called the Thistilfjörður. Probably accessible only by boat. Site open, tower closed. ARLHS ICE-068; VIT-197; Admiralty L4706; NGA 18868. 1945. Active; focal plane 25 m (82 ft); one long (2 s) white flash every 20 s. 19 m (62 ft) square cylindrical concrete tower with lantern and gallery. Lighthouse painted white, lantern red. The design of the building makes it appear at a distance to have one or more black vertical stripes on each face. Arnaud van Beek's photo is at right, Ingvar Hreinsson has a 2001 closeup photo and Bing has a satellite view. This is one of several lighthouses in Iceland that were built during World War II but not activated until the end of the war. Located on a cape at the east entrance to the Lónafjörður, about 5 km (3 mi) north of the fishing town of Þórshöfn. May be accessible only by boat. Site open, tower closed. ARLHS ICE-042; VIT-205; Admiralty L4710; NGA 18900. 1950 (station established 1914). 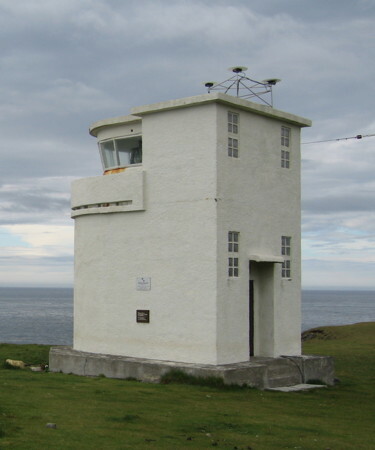 Active; focal plane 53 m (174 ft); two white flashes every 10 s. 9 m (30 ft) round concrete tower with lantern and gallery. Lighthouse painted white, lantern red. Katy Nicolson's photo is at right, Kristinn Vilhjálmsson has a closeup photo, Nunni Konn has a photo, Jirka Krcmar has a 2016 photo, and Google has a distant satellite view. 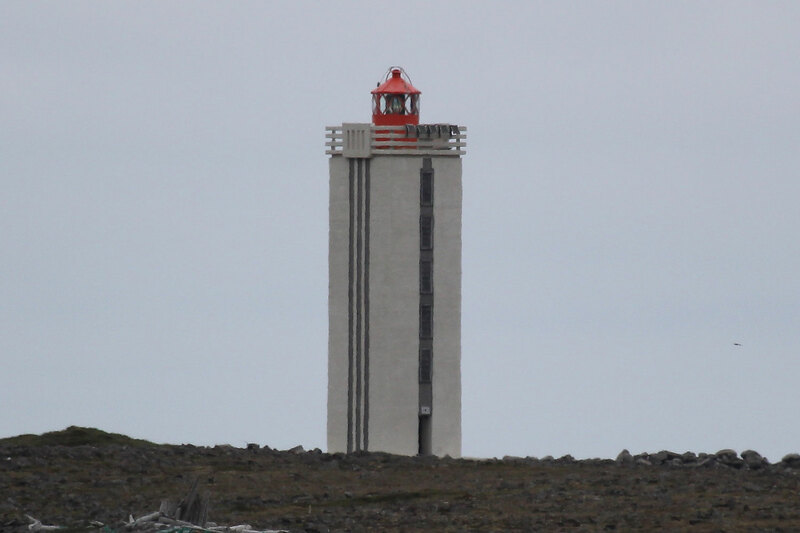 This lighthouse marks the end of Langanes, a long, narrow peninsula that projects from the northeastern corner of Iceland, posing a great hazard to navigation. Ragnarsson's grandfather Þorvaldur Jónsson built this and several other lighthouses in Iceland. 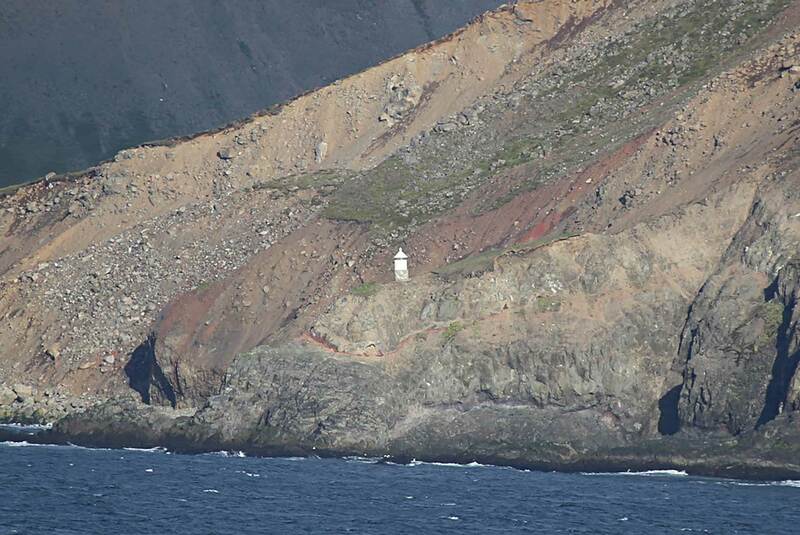 Note: this is one of two Langanes lighthouses in northern Iceland; see near the top of this page for the other one. Site open, tower closed. ARLHS ICE-111; VIT-206; Admiralty L4712; NGA 18904. 1947. Active; focal plane 28 m (92 ft); one long (1.5 s) flash every 20 s, white, red or green depending on direction. 19 m (62 ft) square cylindrical concrete tower with lantern and gallery. Lighthouse painted white with one black vertical stripe on each face, lantern painted red. A good 2009 photo is available, Sigurdur Jonsson has 2007 photo, Huelse has a photo, and Bing has a satellite view. This is another lighthouse completed during World War II and activated after the war. Located on an islet just off a cape 3 km (2 mi) east of the fishing town of Bakkafjörður. A footbridge connects the islet to the mainland. Accessible from town by 4WD. Site open, tower closed. ARLHS ICE-033; VIT-207; Admiralty L4714; NGA 18908. Posted September 11, 2006. Checked and revised March 13, 2019. Lighthouses: 51. Site copyright 2019 Russ Rowlett and the University of North Carolina at Chapel Hill.